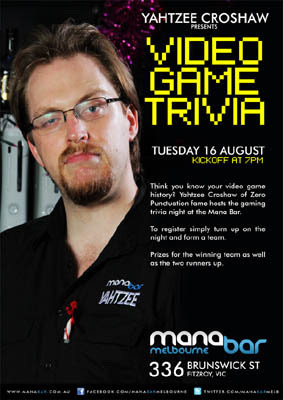 Now, I must apologise for there not being a quiz in the Brisbane Mana Bar this week, because I'm preparing for the inaugural trivia night at Melbourne when I head down to that other city next week. I've made the details tiresomely clear many times over the last 30 quizzes I've done in Brisbane, but here they are again for you shiny new Melbourne peeps: show up on the night before 7 to register a team of 2 to 6 players. No one-man teams, but if you do show up alone we'll group you up with other people so you make many new friends. There are 4 rounds of 36 questions in all, half of which are gaming related, half of which are general. Also: prizes. Things will be fun. But if you miss the night (Tuesday, August 16th) and you desperately need to question me on my opinion on Kingdom Hearts or whatever, I'm going to be in Melbourne for the week, and will no doubt be stopping in the bar on several evenings. I'm there for the Freeplay event at the State Library of Victoria, a wonderful festival of independent games and the examination of gaming as culture and all that. I'm taking part in a panel on Sunday the 21st called The Words That We Use in which we'll discuss the importance of criticism and the critical culture around art. There will no doubt be fun to be had. Tickets are on sale for the conference, but there's also going to be a FREE expo with FREE interviews for those of you who aren't committed. Things, too, will be fun.